My take on the chicken street tacos. We’re using one secret ingredient to add tons of flavor to the meat. Top it with all your favorite taco toppings for a perfect weeknight treat! So i’m a day early, punish me. If you really mind, I can come back tomorrow. 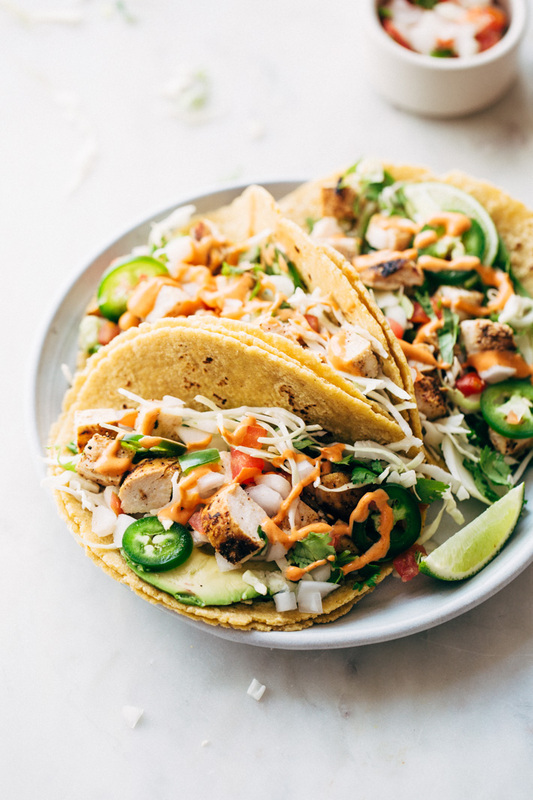 And you will have lost an entire day from the week where you could’ve consumed these insane chicken street tacos that are quick and easy to whip up. 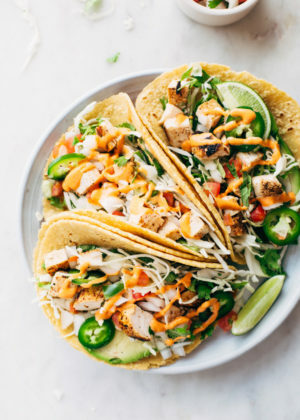 Not only are they loaded with all your favorite taco toppings and drizzled with a chipotle sauce, they’re also as simple as marinating the chicken and cooking it. Let everyone assemble their own tacos with the toppings and the sauce in optional but in our house, it most definitely IS NOT. First off, how was your weekend? Did you grab a cold one and sit out on the patio for a bit? Houston did a little rewind and we had some beautiful weather! We finally caught a light breeze and some sun in after an entire week of dreary weather so we spent the majority of our time outdoors. Warm, sunny days in Houston means two things to me: 1.) flip flops 2.) chicken street tacos! And this weekend we certainly did a little of both. 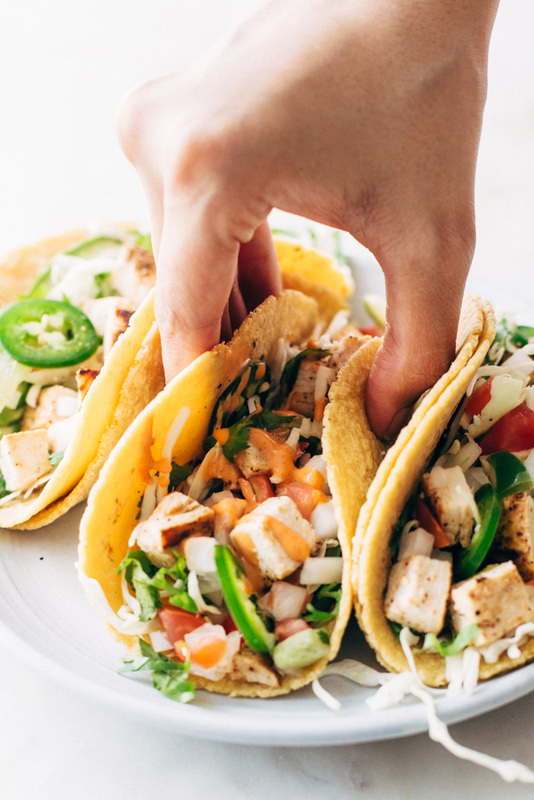 With Cinco de Mayo just around the corner, I wanted to share my quick and easy version of chicken street tacos nice and early so you can plan your feast around them. Make these the main attraction and don’t forget that Mexican Street Corn Salad  — it’s my favorite starter pack to good Cinco de Mayo eats. Living in Texas means we’re definitely blessed with some great Mexican food at all hours of the day/night. You’ll often find some of the best taco trucks or taquerias open late serving flavorful street tacos with mangonadas and elotes. And summer in Houston is a Mexican food lovers paradise! Take it from me, my summer food groups include: grilled corn smothered in butter, chili powder, and cotija cheese and mangoes/watermelons/strawberries doused heavily with chamoy. ❤️ Chamoy is this sweet/salty/sour concoction that makes my mouth water just at the thought of it. Let’s jump into todays recipe. The chicken marinade for my street tacos is super simple. 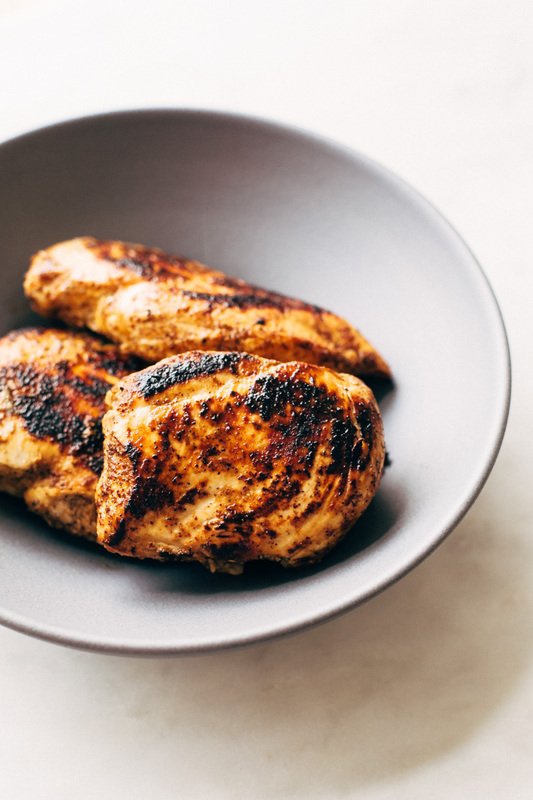 All you need to do is combine lime juice, oil, pineapple juice, garlic, and a few seasonings in a bowl and marinate the chicken for at least 20 minutes. Remember when I shared the recipe for my Steak Fajitas  with you guys? One of the main ingredients was pineapple juice which acts as a tenderizer/flavor profile for the meat. I ran with that same concept and added some to today’s street chicken tacos chicken marinade. Let me say, if you//your husband//kids//neighbors//best friends//parents and anyone else you could and should share these tacos with don’t like pineapple, (which, why not?) fear not, these absolutely do not taste like pineapple. The two tablespoons we use is nowhere near enough to give the chicken a pineapple-y flavor. It is however perfect to add that natural sugar that caramelizes the outside of the chicken and tenderizes the inside. Friends, this chicken is off the hook, chain, or whatever else is can be off of. Super flavorful and ultra tender. 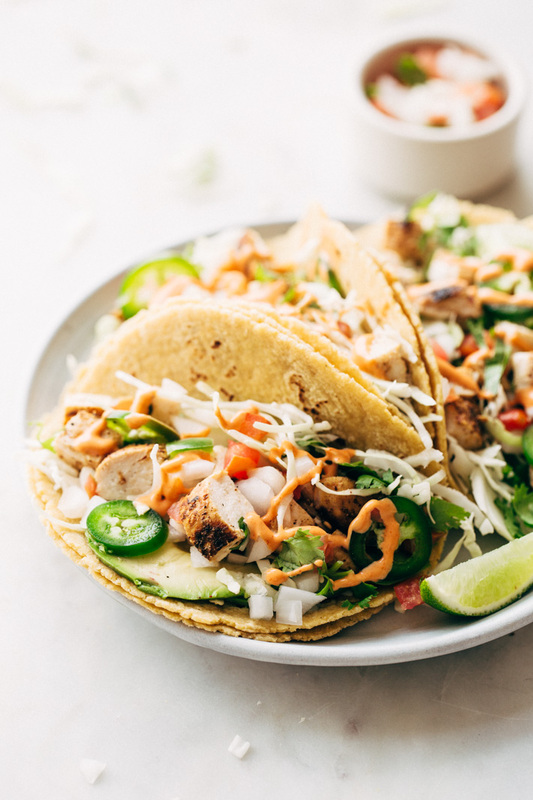 Be sure to let it rest for a few minutes before you dice it to stuff your tacos with, this allows the chicken to retain all of that flavorful marinade and unleash it when you take your first bite of tacos. And for the toppings, the possibilities are endless! 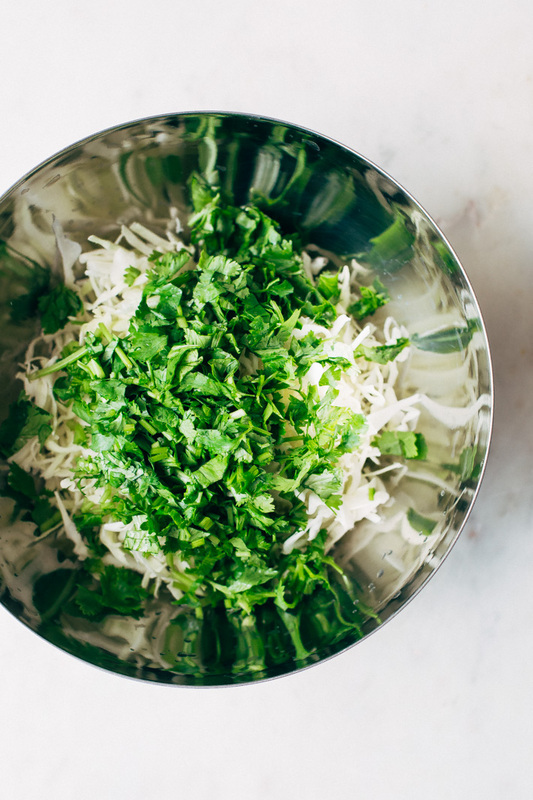 My favorite — angel hair cabbage, a little cilantro, jalapeños, pico, and a slice of avocado and to drizzle — chipotle mayo! It’s totally optional if you’re not into the heat, use Mexican crema or a squeeze of sour cream to cool down your palette. I serve these on corn tortillas as tacos but the leftover chicken can be used in quesadillas, street chicken salads, or even frozen to use for later. 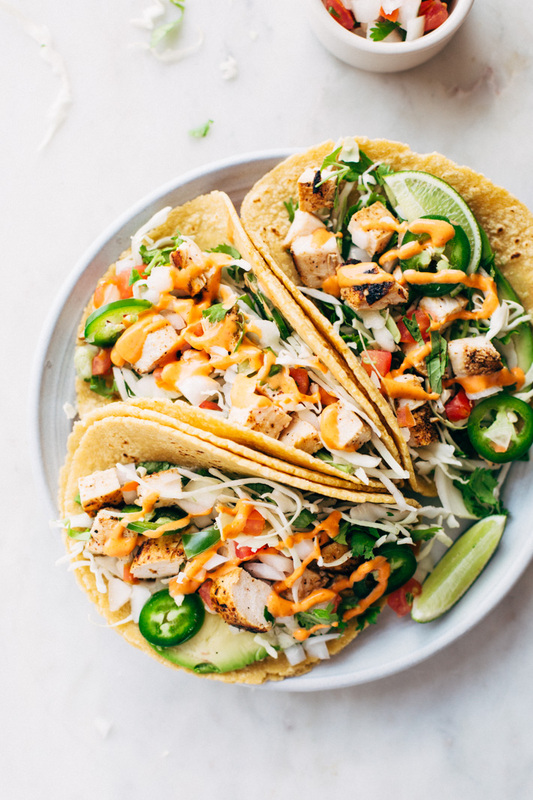 Fall a little lot in love with these easy breezy weeknight friendly ancho chicken tacos! Chicken: combine the lime juice, pineapple juice, oil, ancho chili powder, garlic powder, ground cumin, and salt in a large bowl. Add the chicken breasts (or thighs) and allow the chicken to marinate for 20-30 minutes covered in the refrigerator. When ready to cook, heat a large skillet over medium high heat. Add the chicken to the skillet and discard any remaining marinade. Cook the chicken for 6-11 minutes or until chicken cooks all the way through. Remove chicken to a cutting board and let rest 10 minutes before dicing. Assemble: Top tortillas with diced chicken and add your favorite taco toppings! For the chipotle mayo combine the following ingredients in a bowl: ½ cup mayo, 1 tablespoon milk, 1-2 chipotle peppers + 1 tablespoons adobo sauce, pinch of salt and garlic powder. The chicken can be added to the marinade and immediately frozen if you’d like to use it later. Just defrost in the refrigerator overnight before using.